Peer into my humidor on any given day and you will see about a dozen top-tier cigars, carefully arranged atop a maelstrom of fifty or sixty everyday yard ‘gars. That ratio is a function of my cigar budget. I try to spend less than three bucks a stick on everyday smokes, and with the help of auction sites and closeouts at my local shops I can usually stay in the black — and out of the doghouse. But I don’t review too many average everyday smokes, which is a mistake I should probably remedy. 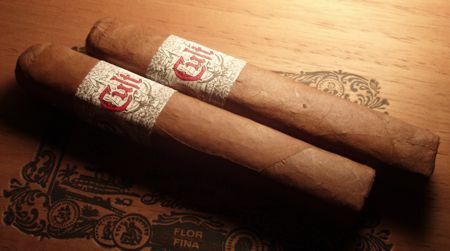 A solid and dependable 3-dollar stick will never inspire the way a limited Fuente or Davidoff might, but high-value and low-cost cigars should still be recognized in their class. Skulls and daggers and death metal iconography don’t impress me too much. A three dollar price tag does. ← Dignity Cigars Newest Cigar the Cuban Zirconia.